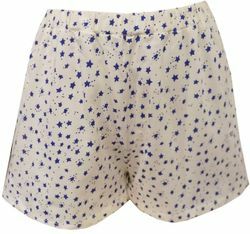 Cutie shorts for sleeping...what. more could you want? Done in People Tree's fantastic organic cotton, with. a pull on. elastic waistline and relaxed fit. You. will want to throw these on the second you get home and not take them off! The star motif is darling and makes us. happy just to look at!